Tallahassee /ˌtæləˈhæsi/ is the caipital o the U.S. state o Florida. It is the coonty seat an anly incorporatit municipality in Leon Coonty, an is the 128t lairgest ceety in the Unitit States. Tallahassee acame the caipital o Florida, then the Florida Territory, in 1824. 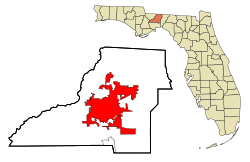 In 2010, the population recordit bi the U.S. Census Bureau wis 181,376, an the Tallahassee metropolitan aurie is 375,371 as o 2012. ↑ 1.0 1.1 "US Gazetteer files: 2010, 2000, and 1990". United States Census Bureau. 2011-02-12. Retrieved 2011-04-23.